LE18 Wine Tasting – Get On the Guest List Today! Every year, Winexpert produces a limited number of exclusive 8-week wine kits. There are three reds and two whites to choose from and the the varietals /styles change from year to year. These wine kits are released on a monthly basis beginning in January. Beyond limited availability, there are a number of other factors that make these wines so exceptional: they can range from unique blends to hot industry trends to rare, hard to obtain and sought after varietals and regions. The main thing to note is that these spectacular wines are produced in limited quantity and are available by pre-order only. CLICK HERE for all the details about the LE18 collection. What is Just Fine Wine’s LE18 Wine Tasting? A challenge with LE wines is that they have to be pre-ordered before they are produced – so how are we to know what the wines will taste like? 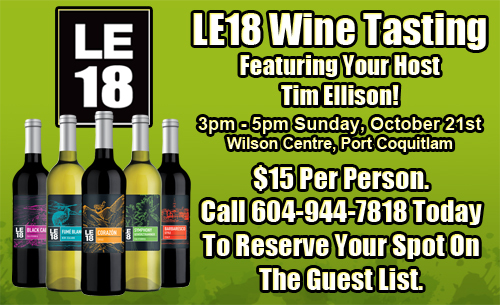 You can find out for yourself at Just Fine Wine’s LE18 Wine Tasting, taking place 3pm to 5pm on Sunday, October 21, 2018 at the Wilson Centre in Port Coquitlam. 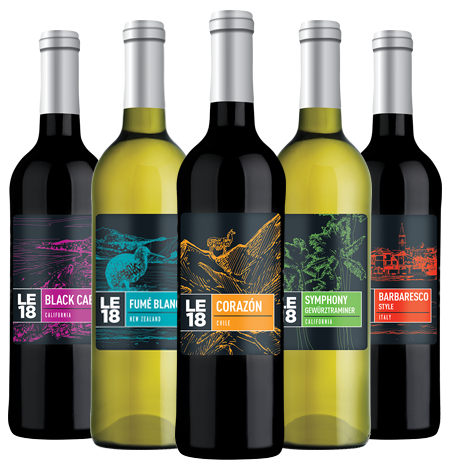 Using ‘commercial equivalents’ (wines recommended by Winexpert and purchased from a licensed BCLDB retailer), you can get an exclusive sneak preview of the LE18’s, months before they hit the shelves. Commercial equivalents for the event are carefully selected to to give you a strong overall impression of what your Winexpert LE18’s will taste like, in advance of their production. Past attendees will attest that as good as some of this commercial wine is, the wine you will craft is always better…and far cheaper! Just Fine Wine’s LE18 Wine Tasting is an entertaining afternoon spent in the company of fellow wine enthusiasts. It’s casual, comfortable, enjoyable, and most certainly not “hoity toity”. In addition to enjoying tasty wines, you also get to sample professionally prepared food pairings that are tailored specifically for each of the LE18 wines. You can experience firsthand how great wines can be taken to an even higher level when complimented with just the right food pairing. Finally, let’s not forget about an entertaining and informative expert on wine & food to moderate the afternoon. Just Fine Wine has been holding it’s annual Limited Edition Wine Tasting for many years but for the past six years we have had overwhelmingly positive feedback to our moderator and constant demand for his return. We agree so we keep bringing him back. We couldn’t be any more pleased to announce that the incomparable Tim Ellison will once again be at the helm, hosting the afternoon for the seventh year in a row. 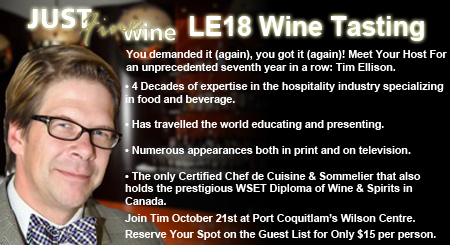 Director of Food & Beverage Service at the prestigious Vancouver Club, Tim is Canada’s only Certified Chef de Cuisine and Sommelier that also holds the prestigious WSET Diploma of Wine & Spirits. Most importantly, he’s hugely entertaining and makes learning about wine an extremely enjoyable experience! Enjoy good food, great wine, and excellent company in a fun and casual atmosphere. It’s a great afternoon you’ll want to be a part of. A fantastic deal for only $15 person. Reserve your spot on the guest list today by contacting Just Fine Wine. LE18 – CLICK HERE FOR DETAILS!